Anhalt et al  first described paraneoplastic pemphigus in 1990. The authors reported five patients with underlying neoplasms who developed oral erosions and bullous skin eruptions. Skin biopsy samples showed both suprabasal acantholysis and interface dermatitis. 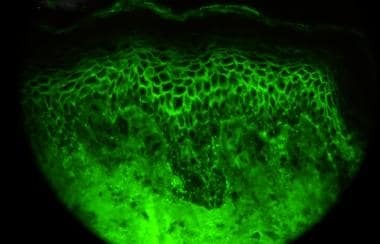 Direct immunofluorescence (DIF) testing and indirect immunofluorescence (IDIF) testing revealed intraepidermal intercellular staining with immunoglobulin G (IgG); DIF testing also revealed deposition of complement at the dermoepidermal junction (see the image below). By immunoprecipitation, target antigens were identified from skin extracts with molecular weights of 250, 230, 210, and 190 kd. Since then, many patients with paraneoplastic pemphigus have been reported, and patients previously believed to have other diseases have been retrospectively diagnosed. Hematologic malignancies are most commonly associated with paraneoplastic pemphigus, although it can also be associated with carcinomas, sarcomas, and benign neoplasms. How tumors induce autoantibodies to plakin proteins is not known. Tumor cells have been demonstrated to produce autoantibodies that react to epidermal proteins. Other postulates include (1) cross-reactivity of tumor antigens and epidermal antigens and (2) tumor production of plakin proteins that initiate an autoimmune response. Dysregulated cytokine production by tumor cells, specifically interleukin 6, contributing to the autoimmune process is another hypothesis. The concept of epitope spreading, with which patients develop antibodies to multiple structurally related and unrelated proteins, may explain the multitude of antibodies produced in association with this disease. No racial predilection is apparent for paraneoplastic pemphigus. The prognosis of paraneoplastic pemphigus is poor. High mortality rates are due to systemic complications, and treatment of the underlying tumor does not necessarily improve prognosis. The mortality rate when associated with malignancy is estimated at 90%. Nearly all patients with the 2 most common associated tumors, non-Hodgkin lymphoma and chronic lymphocytic lymphoma, are dead of disease within 2 years of diagnosis. Note, however, that outcome does not parallel the course of the underlying malignancy. Both the presence of an underlying neoplasm and the adverse effects of the potent medications required to treat the disease add to both the morbidity and the mortality. Paraneoplastic pemphigus is the only form of pemphigus that affects epithelia other than squamous. Involvement of respiratory mucosa, which manifests clinically as dyspnea with normal chest radiograph findings, is an ominous finding that progresses via an unknown mechanism to bronchiolitis obliterans. The most recent estimates are that approximately one third of the deaths from paraneoplastic pemphigus are due to pulmonary insufficiency. Paraneoplastic pemphigus is often fatal, especially when associated with malignancy. Mortality rates approach 90%. Causes of death include the evolution of the underlying neoplasm, sepsis with resultant multiorgan failure, and respiratory failure due to the direct effects of the disease on the respiratory tract epithelium. The latter is being increasingly recognized, and pulmonary involvement has been found to occur in approximately 30-40% of patients. Bronchiolitis obliterans is characteristic. The susceptibility to infection caused by the loss of skin integrity is exacerbated by the potent immunosuppressive medications used to treat the condition. Patients with paraneoplastic pemphigus and long-term survival have been described. Those whose underlying neoplasm is benign, such as in Castleman disease and thymoma, tend to have a better prognosis. A 2012 study on 53 patients with paraneoplastic pemphigus found a mortality rate of 68%. The authors surmise that this was lower than other reported rates because of the inclusion of patients with only moderate, as opposed to severe, disease. Patients with erythema multiforme–like lesions and keratinocyte necrosis on biopsy, especially when associated with severe skin or mucosal involvement, tended to have a worse prognosis. As with any serious illness, patients should be made aware of the poor prognosis. For patient education resources, see the Procedures center, as well as Skin Biopsy.